I was reading both this book, and one other book by Harlan Ellison, when Harlan passed away. While I am always reading more than one book at a time, it’s rare that I am reading more than one by the same author (that other book is Ellison’s original teleplay of “City on the Edge of Forever” … review to come), so there was some strange sort of kismet happening here for me. Though I’ve read a lot of Ellison’s work over the course of many decades, I don’t think I’ve read all of these stories, so it was nice to get the full story, from start-to-end in one volume this way. Though billed as a novel, this is NOT a novel. This is most clearly and obviously a collection of material put together sequentially. It may tell one long story (“may”), but it is definitely not a novel, which is what I was hoping for since that was how it was advertised. I’d hoped that Ellison (or someone of his approving) had filled out the spaces between stories to really make this one long story. But not only is this not a novel, but the final story is included as a film script – the way Ellison wrote it, hoping for it to be filmed. Fortunately I don’t mind reading scripts – I read them all the time for work – but not everyone who reads stories and novels is accustomed to the format of film or television scripts. And the inclusion of a script as part of our story really serves to remind us that this is not a novel of Vic and Blood, it is a collection of their adventures. As such (a collection of adventures), it is well worth reading. Some of the work definitely feels dated, especially given the volume of post-apocalyptic novels and stories available today, and at times Ellison goes a little over the top trying to remind us how smart he is (Blood) and how stupid the rest of us are (Vics), but I’d still rather read some works of Ellison than just about any other author today. If only we could hold Ellison to those words. How sad that when I began this book, I had some hope that there might be some new Vic and Blood stories on the horizon but as I finished the stories Ellison’s death closed the book on any future stories by the master. Looking for a good book? 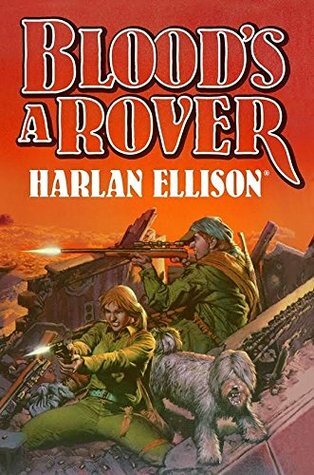 Blood’s a Rover by Harlan Ellison gathers together his collection of stories and screenplays about the adventures of Vic and Blood (from “A Boy and His Dog”) and provides the opportunity to read the stories sequentially, which is well worth doing.